About Time Clock Gives Inaccurate Time | OhGizmo! By Ryan Nill on 09/20/07 • Leave a comment! What time is it? Well, its apparently “maybe more like around eight.” While this isn’t accurate enough for something along the lines of cooking, being useful, or being anywhere on time there are those of us who are not wedded to normal people time (writers, insomniacs, plumbers or UPS delivery men). To those unique beings, this clock could be slightly interesting. 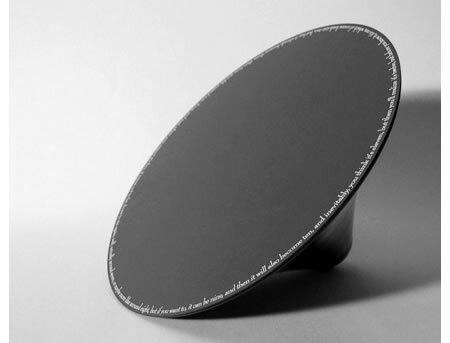 Featuring one long sentence of vaguely time related details, the About Time clock slowly rotates around a flat surface, indicating what time it’s “about.” Much like a large top. Or a piece of performance art. This clock makes a distinct statement for 179$, available now at Greenhead. Maybe it would be prudent not to expect the best shipping service in the world.